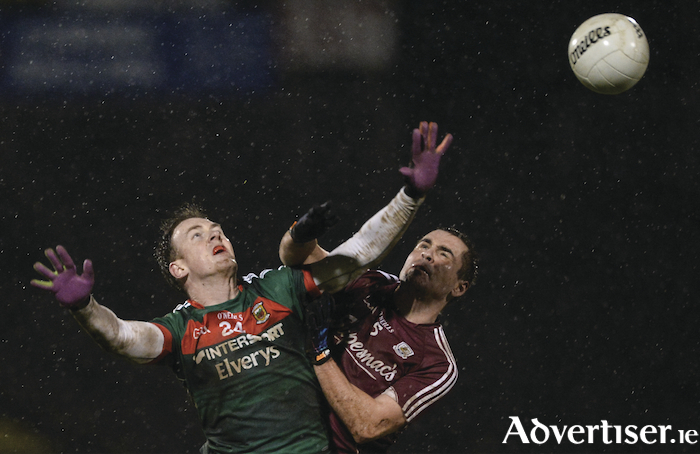 Up in the air: Shane Nally and Cathal Sweeney battle for possession in the FBD League meeting between Mayo and Galway last month. Photo: Sportsfile. Mayo left MacHale Park last Saturday night with plenty of question marks over them. But league form has never been an indicator of what is to come for this group of players, who have more often than not struggled to keep their heads above the water in February and March, only to turn around in the height of summer and attack the water with the power and drive of an Olympic swimmer. The failure to make a numerical advantage count once again raised its head; Mayo's inability to break down the Kerry rearguard after both Ronan Shanahan and Gavin Crowley were sent to the line with a quarter of the game left is something they will need to work out of their system, should such advantages arise again later in the season, when it really counts. While Kerry kicked a string of wides last Saturday night, from the Mayo point of view it was their own poor conversion rate that will sting them, missing half of their 22 efforts. Their return from play was also too low, with just 1-2, Diarmuid O'Connor's first goal and point and Barry Moran's point coming from open field action. That left 1-7 from placed balls for Mayo on the scoreboard and even from frees they missed four scoreable chances, when you compare Kerry's open play scoring, they hit 1-14 of their 1-15 total from play. He also knows that a win is important to ensure they do not come under serious pressure in the final few rounds of games. "All the games in division one are tough games, they are all big results as well because in such a tight and competitive division you could be scrambling for points going in to the last two games, and it’s not a position we want to put ourselves in." On Sunday, Mayo will need to up their play quite significantly if they are to record a first competitive win over Galway in three seasons, and on paper it looks like no easy task. Kevin Walsh's side have two wins from two so far having turned over Tyrone in Tuam on opening day, and following that up with a hard fought win over more Ulster opposition, this time Donegal last Sunday on the road. The Tribesmen have the best defensive record in the top two divisions so far with just 22 points conceded in their two games to date. They also have had the knack of scoring goals early with Damien Comer finding the back of the net in double quick time against Tyrone, and Eammon Brannigan last weekend raising the green flag after just 15 minutes. Walsh's side are back in the top flight after a couple of years absence and they have taken to it with ease so far, Shane Walsh was in top form last weekend notching six points for his side — three in each half — while Comer, now skippering the side, finished that game with three points to his name, and the Annaghdown man, if he hits form, can be a thorn in the side of the Mayo defence. Galway boss Walsh knows that it is not going to be easy for his side to keep up with the other teams who have been playing at this level year in year out, saying after last weekend's game: "We know where we have to improve and where we are getting better. We are aware we are playing catch up and it is really important we are competitive regardless of the result. “Everybody worked really hard," he added. "It was a real team effort. There was leadership from some of our players and they really stepped up. We can improve going forward and we will hope to learn from every game we play."